The discovery of a new moon around Pluto hints that a NASA spacecraft streaking toward the dwarf planet could uncover more surprises when it finally gets there. The tiny new moon — announced today (July 20) and called P4 for now — brings the number of known Pluto satellites to four. And the find, made with the Hubble Space Telescope, suggests that NASA's New Horizons probe could make some big discoveries, too, when it makes a close flyby of Pluto in 2015, researchers said. When New Horizons' work at Pluto is done, scientists hope the spacecraft can investigate one or two other objects that — like Pluto — are in the Kuiper Belt, a ring of icy bodies orbiting far from the sun. Scientists have been mapping out the mission's details for years. The discovery of P4 gives them something else to study, but it doesn't throw a big monkey wrench into their plans, researchers said. The newly discovered moon adds support to a theory that Pluto had a violent past. The system probably formed after a massive collision between two Pluto-size bodies about 4.6 billion years ago, Weaver said. The dwarf planet's satellites likely coalesced from the debris flung into space by this cosmic smash-up. "The evidence is pointing toward that particular theory for the formation of the Pluto system," Weaver told SPACE.com. Scientists found P4 using NASA's Hubble Space Telescope during a search for possible rings around Pluto. (Hubble also detected Nix and Hydra back in 2005.) No rings have turned up, but that doesn't mean they don't exist, Weaver said. The prospect of rings — and perhaps more undiscovered satellites — around Pluto is intriguing to mission planners. 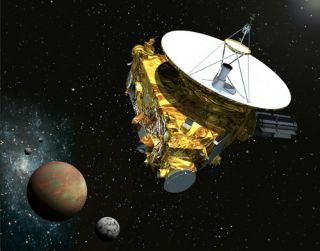 Yet it also induces a bit of anxiety, since the team wants New Horizons to emerge from its Pluto encounter without too much damage from fast-moving bits of dust and debris. "This is motivating us to look even harder for more stuff in the Pluto system," Weaver said. "A lot of that is for safety reasons." New Horizons was designed to unlock some of Pluto's long-held mysteries — what it looks like, what it's made of and the nature of its atmosphere, for example. The discovery of P4 may be raising scientists' expectations of what the probe will deliver. "It just heightens the probability that we'll find something that we hadn't expected," Weaver said.